The beach at Budleigh Salterton is at its most beautiful on a really wild winter’s day but as you can see it was pretty great today too. The water was so clear and still. My sister is in absolute fits because obviously, if it’s nice now it’ll be pouring with rain for her wedding next week. Her logic is that the weather will have used up all its sunshine quota. I did remind her of the non-stop torrential rain we’ve had for the last four months but it didn’t help. Little Owl made me laugh by pointing out the “puffs” in the sky today, so we taught her the word “cloud”. 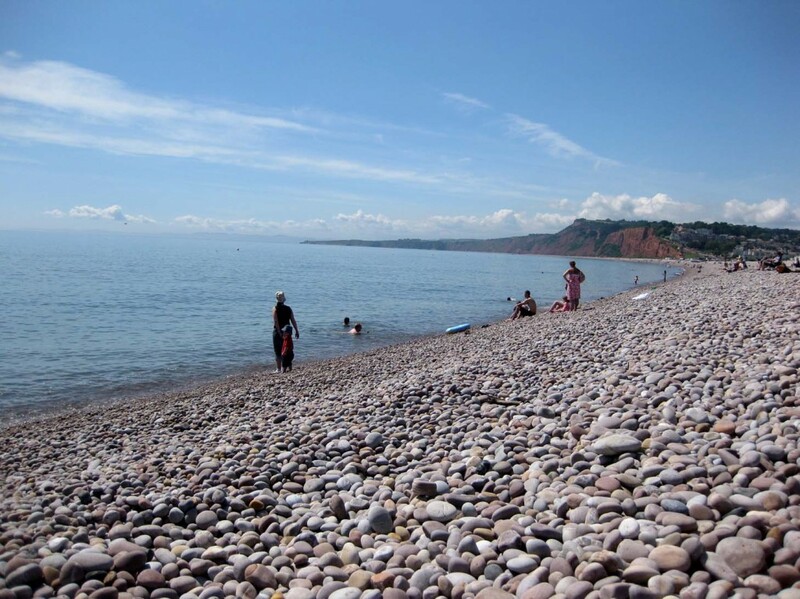 Budleigh Salterton is a pebbley beach where pebbley means proper pebbles not stones. The pebbles at Budleigh are big, smooth, flatenned ovals that chink and chunk as you walk over them. The sort that are so pleasing to hold in your hand. For several years my Dad has been trying to catch mackerel from the beach at Budleigh and has never caught a thing. He hears countless stories of success from his friends but to no avail for him. Last week he was even told that people were out scooping the mackerel up with buckets there were so many close to the shore. He shakes his head ruefully and sighs over the number of fish hooks he’s lost there. This entry was posted in Family and friends and tagged beach, Budleigh Salterton, clouds, illustration, mackerel, pebbles, weather. Bookmark the permalink. I think I have swam here.